1) What is Pilates, Anyways? Joseph Pilates was a pioneer of his time. He came to America in 1926 at age 41 to New York City from Germany with his wife Clara, and together they opened up a studio to teach his method of exercise and rehabilitation. It became known that Pilates was an underground training and rehabilitation tool for dancers and the performing arts community. Joseph Pilates’ original method included a series of mat exercises performed on the floor. As he continued teaching and practicing his floor exercises he was inspired to build his own Pilates equipment. His equipment included five different apparatus; the Cadillac, Reformer, Guillotine, Low and High Chair, Ladder Barrel, Ped-O-Pull, and accessories such as the Magic Circle and Foot Corrector, all very popular today. The Pilates method is a fitness regime that focuses on spinal health, joint stability, flexibility, strength and control. Its benefits include better balance and coordination, injury prevention, decreasing aging affects, and most importantly, the ability to maintain an optimal level of physical and mental functioning. It works beautifully as a rehabilitation tool for injuries and other orthopedic issues, along with helping to develop a strong mind by increasing the strength of the chemical synapse associated with muscle control and movements. 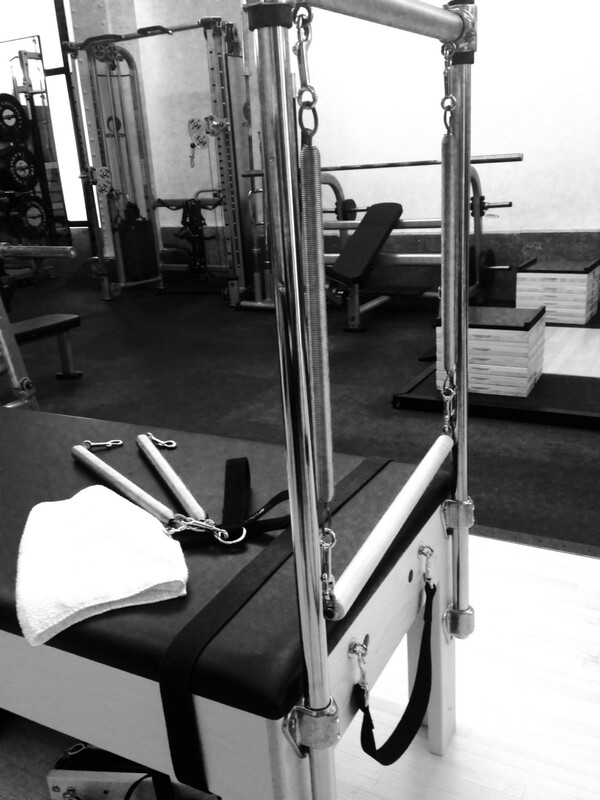 The Pilates equipment operates using springs. Springs vary with different levels of tension ranging from high, medium, to low tension. This is what gives Pilates its unique sensation and uplifting energy that helps restore, rebuild, and strengthen the mind and body as a whole. In any given Pilates exercise you follow set principles established by Joseph Pilates himself. The principles work to strengthen muscles from your inner core throughout your body, and to properly align and stabilize your bone structure by creating more suppleness through your joints, muscles, and soft tissue — both of which allow you to move better and perform your daily activities at your best. When muscles recruit, engage, and fire faster your chances of getting injured decreases because your body absorbs impact easier and you recover faster. Your day to day tasks are done with much more energy, efficiency, and support, so you feel less tired and achy at the end of the day. Some first time students will complain that “there is too much to think about” in Pilates. This is very true — there is a lot to think about when organizing our bodies! Pilates works to change our poor habits, poor posture, and compensation patterns that have developed throughout our lifetimes and don’t work the same today as they once did in the past. Pilates is about re-patterning movements and correcting posture at a nervous system level and as such, it takes time, patience, and persistence in order to break an old habit and develop a new and better one. Our bodies have a remarkable ability to run on autopilot. The alarm goes off and we hit the snooze or get straight up out of bed. Sometimes we don’t even need an alarm clock, our internal clock wakes us up regardless. Once we are up, we are off to tackle the day ahead and our bodies just move, whether we feel good or not, because we have things like a family to take care of or bills to pay. Re-patterning at a nervous system level requires concentration and can move at a slow pace. The goal is to become aware of our bodies in space and to learn how we move incorrectly, so we can know how to correct or change the imbalance/pattern which is causing us pain, discomfort, or injury. Once you complete your first private session you will feel a difference in your body — you’ll be lighter, more open, stronger, taller, and perhaps even more flexible. After ten private sessions you will gain a better understanding of your body and how to move with more ease and fluidity, and you will have a stronger inner core, both of which will leave you feeling happier and more connected to your body. Pilates private sessions are often expensive because you are paying for a specialty training where the benefits and results that are gained last a lifetime, not just an hour. This is because each session is designed to specifically address an individual body’s wants and needs. As noted, it takes time to break old habits and poor posture patterns, to restore and build new connections to your body. The time spent working one-on-one is most beneficial because it gives you knowledge, experience, and results that you carry with you when you leave the studio. It is an investment in your personal health and overall well-being. You will have a refreshed awareness of your body, have complete control over your movements, better posture, renewed energy, flexible strength, and decreased pain which stays with you for life. Michelle Morton has been teaching Classical Pilates with an extensive background and training in Kathy Grant work since 2004. Her acute ability and awareness to understand and see the body in its entirety has allowed her great success in helping people change their body and thinking surrounding movement, posture, and injury prevention regardless of age, size and limitations.